The bid price is simply called a Bid which is the highest price at which a buyer is willing to pay for a security. Offer or Ask Price is simply called Ask which is the lowest price at which a seller is willing to get for selling a security. These terms are used in Auction. The Difference amount between Bid and Ask is known as Bid-Ask Spread or simply spread. When a Buyer and Seller agree on some particular price only then transactions or trade happen start between them. For Example: If the offer price for a T-shirt in a street vendor shop is $10 and the Bid price what the customer starts bidding at is $6 then the Spread value is $4. Rarely these two have the same values. In reality, the Bid amount is not the same and it incrementally changes. If you take the above example, when a buyer gets to know the amount is 10$, he/she would have felt the price could be a little cheaper. Say $6. But they do not go the value $6 directly. Rather, they ask for very little price say $3. Then increase the amount gradually as $4, $5, etc. and when the amount arrives the middle-value $6 what they felt in the first place, they end bid there. If the seller also agrees with the Bid price, the transaction begins. If a buyer is more than one person, then a Bid fight happens between Buyers. In other words, to get a better profit, Investor buys a commodity with a lower Bid Price with respect to the market rate and sells the commodity with the higher Offer price with respect to the current Market Rate. For Example, X gets land for $3000(Market rate) and sells it after 3 years for $4000(Current Market Rate). Hence $1000 is the Market Profit A gets out of it. Bid Price is the maximum price at which a buyer is ready to buy a security. Whereas Offer Price is the minimum price at which a seller is ready to sell a security. Bid Price is the lower price and the Ask price is the higher price. If you want to buy a stock, a broker will set a higher price than that of the offer price. If you want to sell a stock, the broker will set a lower price than that of the offer price, the bid. The profited person is purely relying on the market makers. Whoever is an intermediate person for a business trade, they get profited. The difference between bid price vs offer price is a unique identifier for the liquidity. Liquidity is nothing but how easily an asset can be sold or bought at the same time. Smaller difference amount indicates good liquidity. Both these are two-way Quotations. That is, it is a common term that refers to the highest bid price for a good or service and the lowest offer price for the same asset. Offer Prices cannot be changed and it’s constant whereas Bid Prices incrementally changes. Sometimes the Offer Price is the discount price when buyers get a bulk order of goods. In that case. Offer Prices are made in favor of Buyers (Customer). Bid Price is also made in favor of Buyers. There is no limit for setting the Bid Price but while setting the Offer Price is purely based on the current market rate and it has certain limits. Bid Price is called Auction Price and The Offer Price is called as Impact Price or Ask Price sometimes. When Seller agrees with Buyer’s Bid Price, the trade begins between both of them which is also called as Quoted price. Descriptional Difference The Maximum possible price at which a buyer is willing to buy a particular stock or security or commodity. The minimum possible price at which a seller is ready to sell a commodity. Trade Difference If you want to sell a stock, the broker will set a lower price than that of the offer price, the bid. If you want to buy a stock, the broker will set a higher price than that of the offer price. Weightage Bid Price is a lower price than Offer. Offer Price is always higher than the Bid Price. Colloquial Terms Simply called a Bid or Auction Price. Simply called as Offer or Ask or Impact Price. Stability This is always fluctuating and changing incrementally. Offer Price cannot be changed hence a Constant. 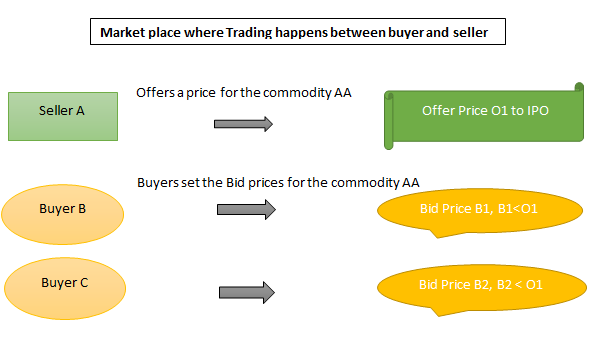 Liquidity For good Liquidity, the bid price should not have much difference from Offer Price. Same as Bid Price. Favor Of Bid Price is in favor of Buyers. Sometimes the Offer Price is the discount price when buyers get a bulk order of goods. In that case. Offer Prices are made in favor of Buyers (Customer). Limitations There is no limit for setting the Bid price. The Offer Price is purely based on the current market rate and quality of the product hence it has certain limits. It is important to know about the Bid Price vs Offer Price to result from the transaction into the profitable amount. Bidder plays the main role in an auction. It is the bidder’s responsibility for the risk assessment part. It is must evaluate the quality of the product to set the correct bid price to get the profit or loss out of the auction or market trade.